There's also a growing interest in the fermentation of vegetables--or more like a resurgence, as humans have been fermenting their veggies for thousands of years. When we talk about fermented veggies, we're talking, of course, about goodies like kraut, kimchi, miso, and real, living pickles! 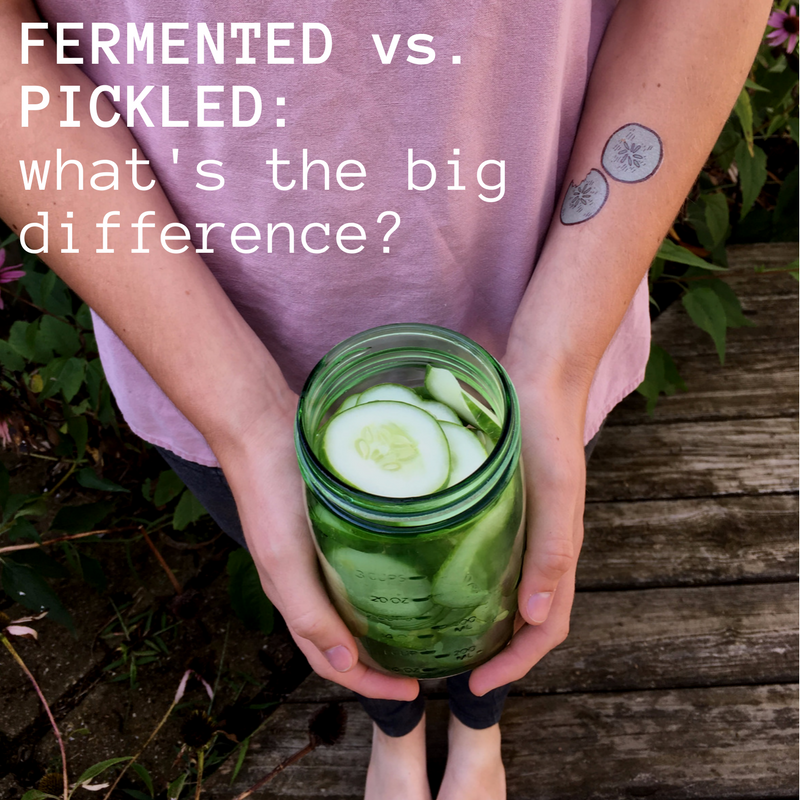 Vegetables take on a whole new flavor profile in fermentation, and making your own veggie ferments is cheap, easy, and extremely healthy. Fermentation works by allowing microbes (naturally present on the surface of living things) to do the good work of converting sugars into alcohols & organic acids--which together form "esters," the unique flavors compounds of fermentation. Pickling mimics the taste of fermented products but not the health benefits. Instead of allowing acids to form naturally, the veggies in conventionally produced pickles are flavored with vinegar and spices and canned (heat-treated to kill bacteria & sealed to keep them out). While fermentation produces an acidic environment in which bad bacteria cannot grow, pickling kills off the bacteria and prevents the vegetables from embarking on the journey of fermentation. The benefit of pickling is that before you crack open a jar, it can last for a very long time without refrigeration (with fermented foods, you have to store them in the fridge once fermentation is complete). The downside is that you miss out on all the great health benefits of consuming a living food. Either way, you're preserving the harvest. Here at Tater Tats we celebrate stuff that brings us closer to the earth and more at home in our bodies and our communities. Fermentation allows us to prolong the life of the plants in our garden and from our local farmers, transforming excess into edible treasures, savoring the seasons and saving up the earth's energy for the times we crave it most. In this way, fermentation helps us love the earth and its caretakers. There is also so many health benefits to eating a side of kimchi with your meal--stirring it into your gazpacho or hummus, or sprinkling it on your baked potato. Appearing in cuisines all over the world, fermented products have been nourishing us for 10,000 years. When we continue this tradition, we love our bodies and the bodies of those we care for. For more information about fermentation & to learn how to incorporate more fermented foods into your life, check out these good folks, below. They've helped us as we've hone this craft & inspired us to try new fermented things! These good folks in West Michigan make delicious organic kraut from local produce with a focus on gut healing and wellness. This must-have tool helps you make your own small-batch ferments. The Kraut Source website is full of great recipes & educational videos. This cooperative turns excess produce from Northeast organic farms into living pickles. If you live in the Northeast, check them out! This October 22nd Texans gather to celebrate their love of fermented foods with renowned expert Sandor Katz delivering the keynote speech. If you're not in Texas, look for a fermentation festival closer to home! San Diego and Santa Barbara host an annual celebration, as does Boston, Massachusetts.